I've had this long white and black skirt for ages but I haven't worn it in a while because it got a couple weird yellow spots right in front. They weren't super obvious but they were definitely there and I couldn't get them out. I set the skirt aside and figured some day I'd know what to do with it. I bought some RIT dye for another project that ended up not happening so I decided to use it on the skirt. I dyed the whole thing orange but, to my consternation, the dye was SUPER attracted to the spots and those areas became glaring splotlights. So I took some royal blue dye and just dipped the top in enough to cover the spots. The end result makes me feel a bit like a walking sunset. The dye job is a little crazy but I love it. Aaron loves it too and I got stopped three times in the grocery store by women asking about my skirt (two were over 65, but still). Like this post? 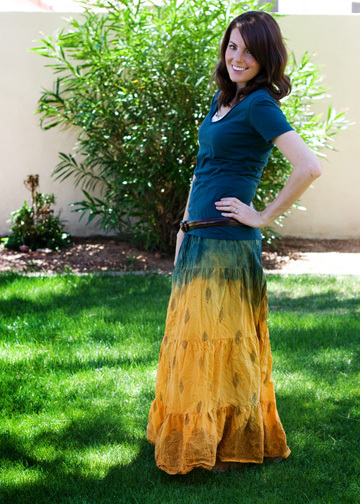 Then you may also like this DIY watercolor dress I made! Okay, I'm not WILD about it as a skirt, but as a dress? I think that might be one of my favorite outfits on your blog. You look amazing. Its not my style as a skirt but as a dress...love it. this is badass! you did a great job with the dye. i love the colors - and i really like it as a dress. I vote dress! Looks great! i love it! your skirt series is getting me seriously inspired to make one of my own. Agreed. It was fine as a skirt but I LOVE it as a dress. Wow! I am in love with the dress outfit! The dye job is unbelievable. You look fabulous. 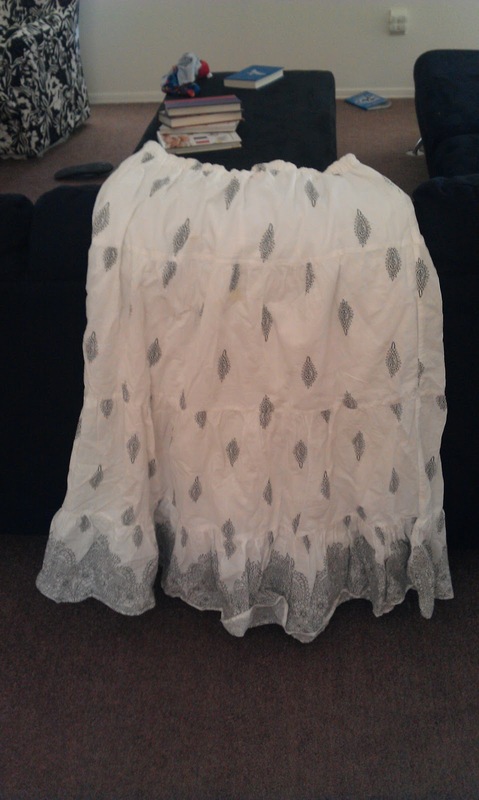 I LOVE it as a dress! It looks phenomenal! I think that is one of my favorite outfits. And you cut open a shirt to make a cardigan? You are seriously too cool for school. WHAT THE HECK? How do you do it?! I love this as a dress. LOVE. ohhh! what a great idea! LOVING it like a dress! Love it as a dress, I must try to recreate it. oh, i like it as a dress too. Ditto with the dress comments. The skirt is cute but the dress is really great. i'm in love with the dress idea. i really need to do that sometime. i just get nervous that it won't fit or look good or something dumb like that. but i like the skirt. all in all a good dye job. i kind of forget that dye exists sometimes. Amazing! The colors look so cool and this was just brilliant! Linking it up on my fb page! I love it as a dress as well! What a great idea! I love how it turned out with the blue bleeding into the yellow/orange! I prefer it as a dress too! Awesome dye job! I like it better as a dress. Looks awesome. Ok. We have to talk. What is Last Chance? Is it similar to a Nordstrom's Rack? Very nice! I'd love for you to link up at Inspire Me Mondays. And you look darling in it! I kept meaning to tell you the other day when I saw you and then...SQUIRREL! I'll be featuring this on my blog on Saturday! Girl, you got style!!! :0) I love the skirt/dress/skirt-dress. You have some great fashion ideas. wow! just found your blog and its awesome!!!! Loving the skirt series so I'm going to go browse some more. I love this skirt you did Kayla! The colors... swoon. I love it as a dress too. Thank you so much for linking up! I appreciate it!